Starring: Daniel Kaluuya, Allison Williams, Catherine Keener, Bradley Whitford, Caleb Landry Jones, LilRel Howery, and more. “I looked straight into the windows of her SOUL, and you know what I said? I said…. biiiiiiiiiiiiiiiiiitch.” ICONIC, iconic (okay maybe I am exaggerating but whatever) line of comedy from the skit comedy show called “Key & Peele” that aired on comedy central. 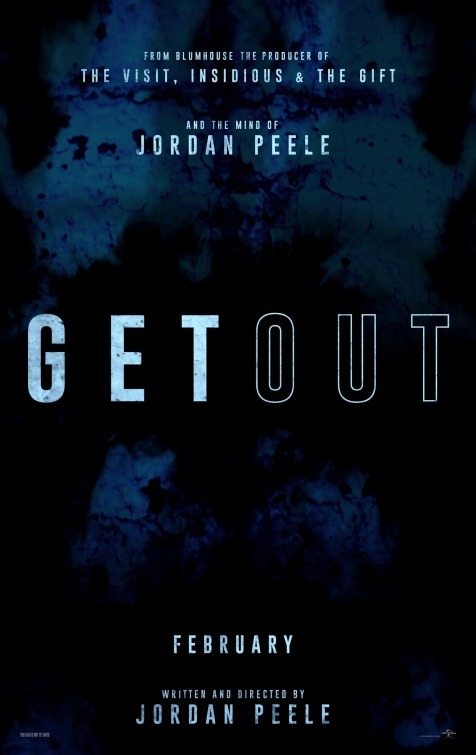 Now whether you know the show and the individuals that are Keegan-Michael Key and Jordan Peele or not, you will at least be aware of one of these gentleman after this review and hopefully after you have seen this horror/thriller that is ‘Get Out’, directed and written by Jordan Peele. Welp, let us begin. All seems normal in the life of Chris Washington (Daniel Kaluuya) as he plans to go visit his girlfriend’s family for the first time. Although he is cautious due to him being black and in an interracial relationship, he asks Rose (Allison Williams) if they know he is black and if they are fine with it. As she assures him all is well and it should be a pleasant visit, ultimately, this visit is far from “pleasant”. Sir, you succeed. No room for sugar coating, as Jordan Peele did not do so in the slightest in ‘Get Out’. This film may be one of my favorite films in the past decade and maybe ever. Again, one of my favorites, not all time favorite, calm down. This film was so brilliantly done from performance, to story, to the meaning behind it all, to the twists, just everything. I think what I truly loved about all of this is the originality behind it all. Jordan Peele wrote this and directed this. As it may have a few nods to past films (which, c’mon, what film does not take or at least nod to a past film? ), it ultimately left me so satisfied to witness such a creative horror/thriller… Another thing this film did so brilliantly was keeping the audience curious until the very end. Although some things could be predicted, I personally still sat there thinking “what in the f*$# is going on, what are these people doing?”. It is almost as if Jordan took his dark comedic skits from “Key & Peele” and eliminated the comedy and let the dark vibe of it run wild… Lastly, the performances. Applause all around to everyone involved. I hope to see some of these actors and actresses in more projects in the future. I received a very strong Robin Lord Taylor (Oswald Cobblepot/Penguin in ‘Gotham’) vibe out of Caleb Landry Jones and could foresee him taking on more villainous roles in the future. Betty Gabriel (Georgina) has been a favorite of mine with her involvement in “The Purge” films and seeing her involvement and performance in this film just reinforced that favoritism ten-fold. Daniel Kaluuya is a star-in-the-making, absolutely loved him in his main role. Last but not least, LilRel Howery stole the show. No matter how dark ‘Get Out’ got, LilRel’s scenes are when the film takes a breath in the form of laugh-out-loud comedy. Brilliant performances all around. Lastly, the meaning behind it all is truly something to marvel at. Jordan Peele tells a real living true story and masks it in the form of this film. Without spoilers, I can not go any farther but I would highly advise you; do some research after viewing this film and see what Jordan’s message is that he conveys through the result of this film. I had majorly high expectations for this film since I first saw a trailer for it and impressively they were exceeded. A horror flick from the mind of Jordan Peele. See this, folks, it is a good one. Posted in 2017 Movies, Movie Review.Tagged Allison Williams, Bradley Whitford, Caleb Landry Jones, Daniel Kaluuya, Get Out, Jordan Peele, Lil Rel Howery.